IT is now the highest grossing horror movie of all time and it couldn't be more deserving. The film manages to find a perfect balance of original horror while hitting the tone that Stephen King set in the book all those years ago. 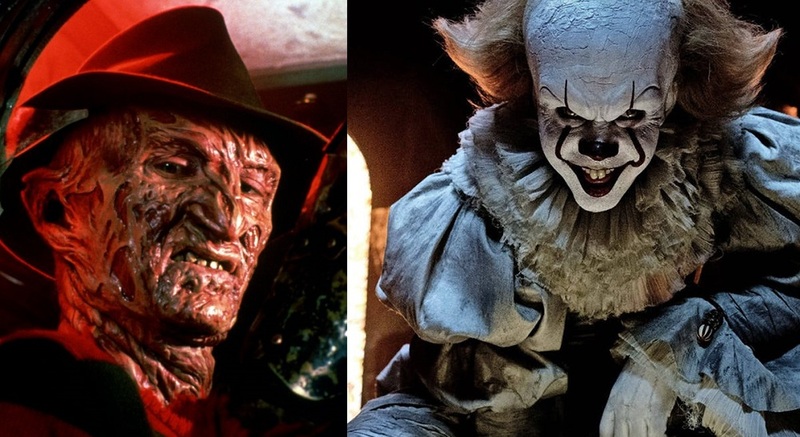 Adapting King's work to the screen is not an easy task, but Andy Muschietti has done what very few are capable of and it is paying off in spades. Yet one thing felt missing in the film and it's odd because all the signs were there. IT was supposed to take the form of Freddy Krueger. In the book Richie Tozier has a fear of the werewolf from I Was A Teenage Werewolf after he saw the film at the Aladdin Theater. IT takes this form at the house on Niebolt Street and attacks Richie while wearing a varsity jacket with Richie's name embroidered on the chest. The 1990 miniseries does a small adaptation of this by having IT become the werewolf while Richie is in the basement of the school looking for a mop. The backstory of the Richie seeing the movie stays mostly intact. This current adaptation, however, has been updated and set in 1989 and along with the setting all references to the time had to change as well. Also I must note the company that produced this is New Line Cinema (WB), the house that Freddy built, which right there sets the stage for Richie's fear. Add to that in the film the theater is playing Nightmare 5: The Dream Child and we can see where this is heading. We even see Richie hanging out at the theater playing in the arcade, which one would assume is after he saw the movie. With all that build up a Freddy cameo seems like a no brainer once we hit the Niebolt house, yet it never happens and Richie reveals he has a generic fear of clowns. Actually the reveal of his clown fear and the scene with all the clowns seems really disjointed from the rest of the picture, which raises the question of why no Freddy? The only conclusion that I can come up with is that this is one of those things that looks really cool on paper, but didn't play that well once conceived. Because for it to work properly they would have had to bring in Robert Englund to play Freddy for only 30 seconds of screen time and the tone would have shifted from awesome IT movie to cool IT movie with an awesome Freddy cameo. Since I doubt anyone wanted to overshadow the entire film with one cameo they scrapped it and just came up with the generic fill in. Could a Freddy Krueger scene have worked in the film? I'm not sure and unless it was actually shot before it was scrapped, then we'll probably never know.